Mid-summer I got my hands on Ableton Push and was floored. So. Much. Damn. Awesome. Instrument. (obligatory overused doge meme image here). I had been using NI Maschine for a while, which is pretty cool in it’s own right, but I never loved it’s built-in sequencer. The workflow and sounds though . . . if only I could easily sequence them in Ableton Live somehow! Ultimately after much trial and error, I came up with a workflow that worked. I documented it on the Live forums, and then blend.io (great service, I’ve been slacking!) picked up on it and I guest blogged there about it. Anyway, fast forward several months and Native Instruments released v2 of Maschine’s software. Great update, but in doing so, they broke a few workflow things, which sent me back to the drawing board. Annoyingly I had to wait for a few sub-updates first, but now it’s all back in action. Create a Midi track and name it Maschine A. Put an instance of Maschine on the Maschine A track, right click on the instrument and select Group to Drum Rack in the menu. Set Maschine receive in drum rack to All (click on the I-O button on the bottom left of the Drum Rack to expand to see this menu). Click the group A1, then click Group, then click Input. It should look like the below (specific items highlighted in white). In the MIDI section, turn “Active” on and set the Channel to 1 ( as seen below). 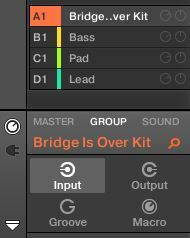 You can now trigger and sequence that group using the Ableton Drum Rack and Ableton’s clips! Create 7 additional Midi tracks and name them Maschine B, Maschine C, Maschine D, etc;, The letter is to reference the Maschine group. Select all 8 tracks and group them (Command-G). Name the group Maschine. Add an Ext Instrument to B, C, D, Etc. Set each Ext Instrument MIDI To: Maschine A and then the associated Maschine output – for example doing this for Maschine B, the 2nd dropdown in the external instrument should read 2 – Maschine. Do the same for C (would be MIDI to: Maschine A and 3 – Maschine), and D, and how many other Maschine groups you plan on using. Set the Audio From in the external instrument to the corresponding Maschine external output. For simplicity this should be the same number as the midi channel for that group: Maschine B’s external instrument will read Audio From – Out 2/-Maschine. Therefore Maschine B will be on Midi channel 2, AND audio from Out 2/-Maschine. To make each Ext Instrument function as a Drum Rack (note this is with using Push’s drum rack mode in mind), right click on each Ext Instrument and select Group to Drum Rack. Follow the same steps as in Maschine A with regards to the receive in the Drum Rack (all). 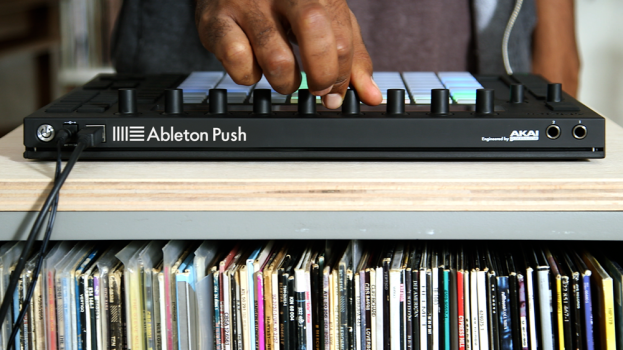 Starting with Group B, click the Group section in Maschine and then the Output button. Under Audio, set the Dest. to the associated channel. E.g. B would be Ext 1, C would be Ext 2, D would be Ext 3, etc. Now you can have potentially 8 separate Ableton drum racks, each controlling their own group in Maschine controlling everything with just the Push! Good luck and hopefully you’ll find this technique helpful in some way, even if it’s just a jump off point for your own setup. I reached out to blend.io a bit ago about updating their blog, but no word back. Will try to get an updated template up as well so you can just pull it down, save it as your own, and roll. Glad you liked it and that I could help out! Thanks for your tutorial, and your template (blend.io). I use it with 4 keyboards, and wonder if it´s possible to load a kontakt multitimbral plugin in a group, wich I could change the sound by pressing one of the 16 pads..? Not sure I follow completely . . . So you’d load a Kontakt plugin in Maschine, correct? If yes, give me an example one so I might play about and see if I can help (don’t use Kontakt much). 2- Group B : a Bass group where I load un sound 1 a Kontakt multitimbral instruments, sound 2 that plays sound 2 from Kontakt, etc. At the moment I can play with Maschine one selected bass if I select the corresponding pad and active keyboard mode, but I want to play with one of my MIDI keyboards (LPK25 for bass) instead of Maschine. And then I would play group C with another MIDI keyboard (MPK Mini), and group D with another keyboard (Arturia Analog Factory). 4 -and Analog Factory MIDI keyboards for lead (group D). I loaded up the template but got an error about Kontakt. What instrument is it? I have NI Komplete Ultimate, so maybe I have it as well? Also, one thought, what if you right click the devices you want for each control surface and do “lock to LPK25” or “lock to MPK Mini”? I haven’t tried that in years myself, but may do what you need. An error ? I don’t use third librairies for bass, so I don’ t know. But you can load your own sounds in kontakt in group C that is empty, so I think that there will be no problem..? I don’t know the option “Lock to”, I will search. I suppose I have to put my differents MIDI keyboards in “MIDI inputs” in audio/midi preferences of Maschine and Kontakt ? I didn’t find anything about the option “Lock to”, so if you can tell me where I can find it ? If you got another idea..? Sorry, I just saw this reply. I guess I don’t fully understand what you’re trying to do. I re-read your original post just now though, and I think maybe I had it wrong, you tell me though . . . I thought you were trying to play Kontakt “zones” with multiple keybards (e.g. LPK25 for Bass zone, MPK Mini for synth zone, etc). That seems incorrect though. If you’re trying to play “B” with one keyboard, “C” with another keyboard, etc; I would think you should still do “lock to” for each keyboard, but then also record enable each track so you can play them at the same time, make sense? If not, try explaining again and tell me what “doesn’t work” with lock to . . .
What you said is exactly what I need : one group for one keyboard. The goal is to have the choice, in live situation, between 16 différents sounds by keyboards, so I don’t have to stop ableton, choose an instrument in Kontakt Library with the mouse and then press play, etc. I use Kontakt multiple outputs in order to preserve CPU. With your set and the external instruments (one per group), the option “lock to” doesn’t appear in the “Ctrl+clic menu” (it seems to work only with native ableton instruments..). And so playing simultaneously ans independantly with all my MIDI keyboards is still impossible. There’s gotta be some way. I clearly just don’t know what way that is, sorry. If I think of something else I’ll update here though. You try posting on Ableton’s or NI’s forums? sorry but my email …. dosent work. Updated that for you. What’s the dropbox for though? Hi there, thanks for these instructions, however whenever I hit a pad on Push it triggers all 8 groups at once. I re-read your instructions and have setup exactly as you described. What am I doing wrong? What version of Ableton and Maschine are you using? Hi Tekmonki, any advice here? Sorry man, been a bit busy with work and such – will try to get you an answer/advice in the next few days. Bump on this question, any assistance to troubleshoot? Hey thanks for this! Best of the both world. Anyways who ever are having problem setting up the above mentioned method of sequencing maschine inside ableton live. TekMonki has also uploaded a live 9 / mashinc template. SUPER COOL! Working for live 9.2.2 & Maschine 2.3! Great, glad you like it man! Thank you! This is so usefull and saved me a lot of time! 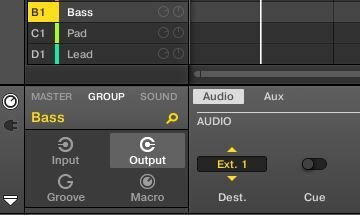 1) I guess it’s impossible to trigger a same group from an ableton clip with notes in pad made and outside pad mode at the same time, right? 2) Is it possible to record into the same ableton track from maschine and from push at the same time? The best option i’ve found to record midi from maschine into ableton (while having the option to record midi from push too) with this setup is to create a new midi track, midi output from each sound of the group destinated to “host”, and in the midi track select the midi input from maschine. The problem is that i can’t pick a midi chanell input from ableton, so if there are more than one group playing then all the midi information goes to that midi track. Any clue? Hey … Thanks for this. The setup is great for sequencing drums. How do you manage separating out the parts for mixing? How do you manage KEYBOARD / CHORD Mode for the pads? Hey Noah, sorry for the delay – work, blizzard, life, etc – been a while since I’ve messed with it so I don’t have a ready answer, but will try to get you one. If you end up sorting it out on your own, feel free to post it up here or wherever if it can help someone else (including me at times, heh) too. Hey great thx for coming back to me on this! Look forward to any ideas and or further replies and certainly i will post any solutions i come up with! Cheers! Where can i get the template? Daamn! Thank you so much!! but how do you handle your automation? if you do it in ableton you have all your automations of all 8 groups on one midi track (maschine A) 😮 is there a workaround to spread the automation on the different midi tracks (A,B,C,…)? This saved me so much time. Thank you for sharing. Cool, glad to hear it. Plan on getting a Push 2 soon (purty colorrrrs!) and at some point will update template if needed and maybe write up some differences and such. Later for that though! After messing around with this method for a while, I still can’t figure out how to get the velocity in Maschine to be 127 for all pads? Some people might find the Audiomodder packs usefull here since it lets you quickly swap out any Maschine kit and the routing is already still configured to use in a template like you show Tekmonki. Haven’t tried out the latest and greatest since I’m in the middle of “reinstall/set up/fine tune everything” fun on a different machine AND waiting on the Push 2 to be bundled at my post-blizzard doorstep, but definitely check out Audiomodder if I’m taking too long to respond (sorry), you’re stuck, or just ‘cos it’s good stuff! I got every thing working but theres a huge latency on the pads. Any idea what may be causing this? Never mind I figured it out. Thanks so much for this, very helpful! Great, glad to hear you got it working! Hi, I love this, and haven’t been able to walk through the full thing yet… However, I have gotten where I can trigger sounds from maschine in those drum racks… Quick question, can you drag midi from maschine over to this as entire group? Second, in regards to a maschine drum kit, can I put a live 9 eq on the individual kick, snare, hit, etc in the drum rack… Because yesterday that’s the part I wasn’t able to get through on..
It’s been a little bit since I’ve messed with Maschine, particularly since upgrading to the latest and greatest with Live, Push, and Maschine (software only w/ Maschine). As I recall though, and may have changed with the update, needed to save/export the MIDI to get it into Ableton – kinda annoying. And yeah, you should be able to just drag/drop an EQ on each pad easy breezy like. Thanks so much for this. It works great. !! I don’t think your intent was to also be able to drag and drop midi with this technique, but can it be extended for that purpose? For instance, I dragged/dropped a midi pattern from Extra Percussion Kit, which has pitch changes in the”Surdo Open Extra Perc” sound. But those changes don’t occur in Live. Maybe there is another approach if you want to leverage parts of Maschine patterns that have pitch changes on some of the sounds? Anyway , you’re a great help. Thanks!! Hey, glad you like man!! And good question. I assume you mean you’re dragging the MIDI from Maschine into Live and the pitch stuff isn’t registering, yes? Exactly! Yes, sound parts, say the kick, that have some pitch changes when played in maschine, don’t have those pitch changes after dragging the midi over to Live. Was wondering if this template’s setup utilizes multi-core processing? Hey, hope you find it useful!! As to processing, it should default to whatever version of Live/Push/Maschine your machine is using. So in Live – you only leverage multi-core processing when splitting things up across individual tracks. So say I have a Kontakt instrument with 5 unique Kontakt instruments inside of it – the way to leverage multi-core is to split off each of the 5 on 5 unique Live tracks, whereas if you load them all into one track it stays on one core. Here since Maschine is only on one track – but controlled from and routed to various other multiple tracks – I’m wondering if you get Live multicore performance or not. Thanks again!